I have been away for too long. I apologize from the bottom of my heart and I thank everyone on twitter, facebook, instagram and even through email asking me where I have been and why I haven't blogged for so long. I also apologize for not replying to most of your messages and comments which I really appreciate. Truth is, I didn't even realize that I've been away for so long even though I miss blogging. But I just didn't know where to start. I realize my last post was in November 2011. That was roughly the same time as the start of the busiest period of my work up to January 2012. Alhamdulillah, even though it was so hectic, I learned so much and I feel that I have developed so much professionally in such a short period of time which I am very thankful for. But believe me, it was so hectic my colleagues gave me the nickname Bionic Woman! But I always believe that we have to work hard when we are still young and where we have so much to learn and we are better able to absorb knowledge so we will be able to reap its benefits in our later years. In that time, my work took me to Jakarta, Singapore (at one time, both Jakarta and Singapore in the same day!) and also England which was in a lot of ways a blessing. I went for days without sleep, and everything else had to take a backseat: My family, my friends, this blog and most importantly, myself. After it all ended, I took some time to spend with my family: another trip to Jogjakarta for a week. I then vowed and tried to achieve a healthy work-life balance and started to spend more time with my family and dearest friends when I had free time off work. I also took the time to read more books whenever I could. That said, I don't think I completely disappeared. In between, I have kind of been guilty of micro-blogging through twitter and Instagram (believe me, I was very ecstatic when it was made available for android!). For those of you who would like to view the pictures in my life, you can do so there (both IDs @rnadiasabrina). But even though I agree that a picture is worth more than a thousand words (maybe two thousand, although I don't think I've ever written more than that on here! ), I suppose words can make anything more meaningful and I'm hoping that I will be able to restart writing on here. In between November and now, there has been so many things which has happened to me personally, professionally, events, etc. So much so that I don't even know where to start anymore. 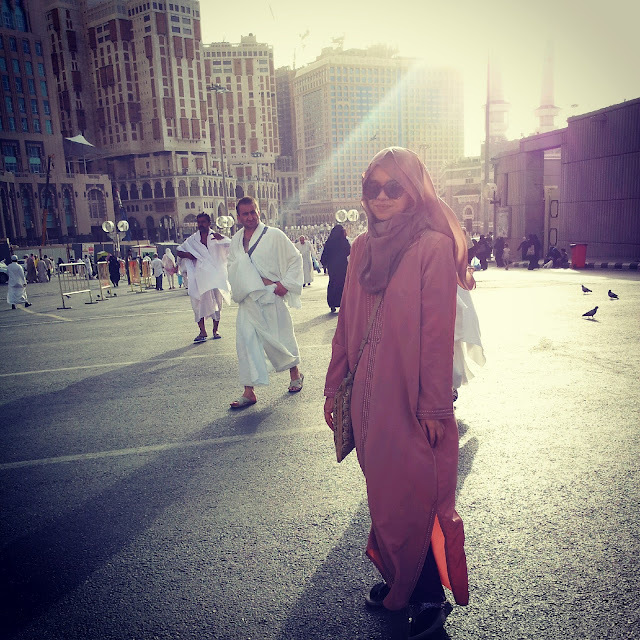 But most recently, I was fortunately blessed to be able to go to the Holy Land for umrah, Alhamdulillah. All praises to God Almighty for calling me to His House. It has been a life-changing experience which I hope to share more with you in my future posts. In short, my recent journey to God has been an awe-some spiritual experience which has given me a whole new perspective in life and I think I have found my one true Love and the true meaning of happiness. I am in a state of peace ever since I've been back. (",) i'm glad u're back . welcome back.. adore ur style..